Retrofits and remodeling often require measurements and drawings of a remote location or client site so that a part can be manufactured to fit. Photogrammetry creates measurements and diagrams using a normal camera. Instead of having a complex and expensive device to do field measurements for your retrofit or remodeling business, you only need a camera and a tape measure. There are several applications for photogrammetry in manufacturing. This article talks about one aspect: applications where measurements are made in the field and an object is manufactured at a factory to fit those measurements. That is, the refit, retrofit, or remodel application. Measuring kitchens & baths for manufacture and install of counter tops and cabinets. Measuring boats for manufacture and install of covers, biminis, decking, and upholstery. 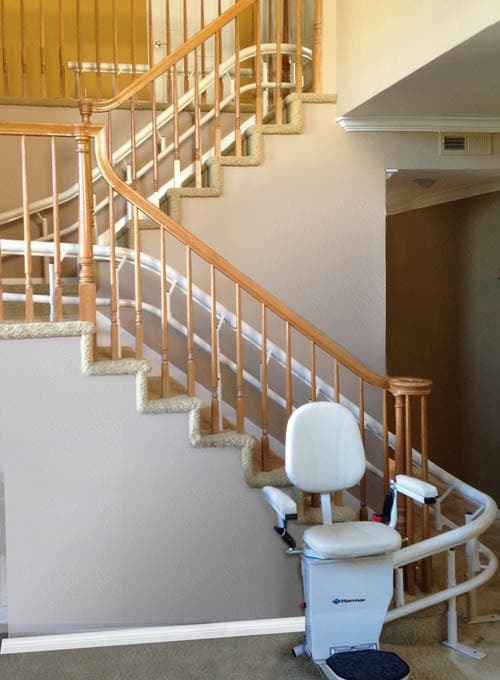 Measuring stairs for manufacture and install of stair lifts and railings. What these applications have in common is the need to obtain accurate measurements at a remote job site and return those measurements to the factory for further CAD work and then manufacturing of the objects and parts. If you run a business that does this type of manufacturing of retro-fit parts and systems, what are the criteria for a good field measurement system? Photogrammetry fills these requirements. Standard cameras are inexpensive and very portable. Cameras can be simple point and shoot, or full DSLR, and in some cases, smart phones. In addition, sometimes a kit of small targets will be used by the field agent – these tend to be inexpensive, easily replaced, and small and light for shipping. Targets can also be printed on plain paper at the field site. Taking photographs (and sometimes setting up the targets) is quick and faster than many other measurement and diagramming techniques. Photogrammetry can be very accurate, especially with well-developed procedures. Using photographs as your source of data means that you can re-open those photos at the factory and add measurements at any time (if the points of interest appear in two or more photos). Lastly, PhotoModeler exports data in formats compatible with many CAD packages. A couple of the applications mentioned here, boat covers and kitchen counter-tops, have traditionally used a 2D templating method. That is, a flat sheet template material was taken to the site (kitchen or a boat) and an experienced operator cut and drew on the template. 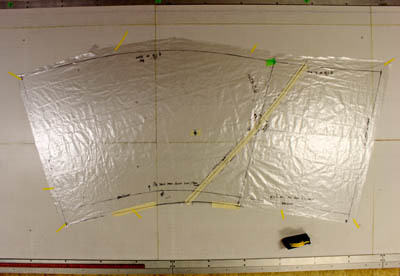 The resulting template matched the shape and size of the final piece to be manufactured. When the templates are returned to the factory they need to be digitized so they can be used in CAD for further design work. PhotoModeler can be used for both full 3D object measurement (where typically the 2D template stage is skipped), or for accurate 2D template digitizing. Certain tasks might continue to be easier with traditional templating, and in other cases, moving to full 3D templating or object modelling might be a good way to go. Read the article, ‘How to Digitize Templates and Patterns With a Camera’ to learn more about 2D template digitizing in PhotoModeler. A field agent starts with a calibrated camera (DSLR, point-and-shoot, or smartphone), a tape measure, and an optional set of coded targets and scale bars. 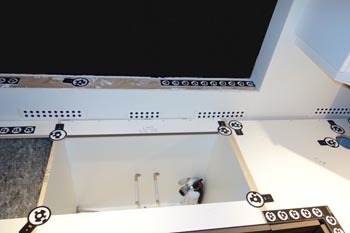 If coded targets and scale bars are in use, the agent places them in the scene, and on key locations (edges of cabinets, corners of walls, nose edge of stairs etc.). If no scale bars are used, the agent takes a few measurements of key features in the scene with a tape measure and notes the measurements and the features used. The agent takes several photographs from different positions and angles (each application has a different set of requirements for photographs). The number of photographs also depends on the application and scene but could vary from 4 to 50 photos. The agent collects up any coded targets and scale bars in use. The photographs and optional measurements are uploaded or emailed to the factory. The factory agent loads the photos and data into PhotoModeler and creates an accurate set of measurements. The factory agent does some quality assurance checking scale distances, shapes, etc. The data is exported to the factory’s CAD system for further work. The parts and objects are manufactured. The parts and objects are returned to the client site for a perfect fit! There are several applications of photogrammetric measurement in retrofit work. Three of the most common ones involve stairs (for lifts and railings), kitchen/bath refit, and boat templating. The following sections show examples of each. There are two main applications in measuring staircases in homes and offices. The first is the retrofit of stair lifts, and the second is measuring for more complex banister / railing installation (curved stair cases). Kitchen and bath remodels, or new construction requires accurate measurements of walls shape, dimensions, and placement of existing cabinetry and outlets for complex cabinet and counter-top installs. There are several applications of measurement and modeling needed with yacht and pleasure craft retrofit. 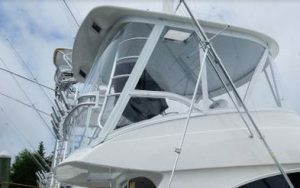 Examples are manufacture of full or partial boat covers, biminis, windscreens, complex decking, and upholstery. Is PhotoModeler the Tool for You? 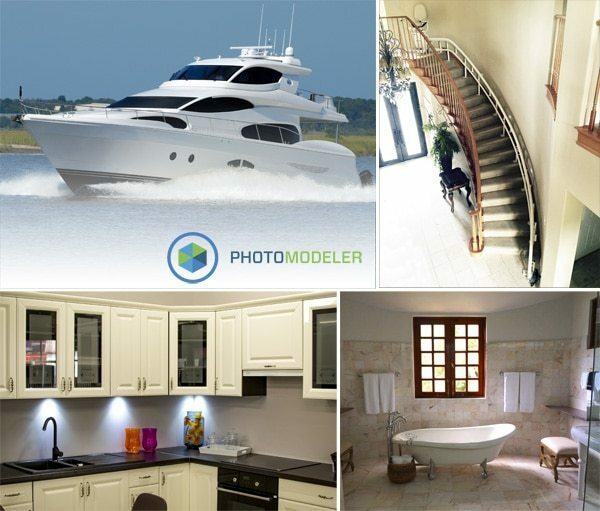 If you are in an industry that does retrofits or remodeling with manufacturing at your factory, and you require maximum customer satisfaction while reducing cost, then PhotoModeler software is something to consider! While three common applications are shown above, perhaps you have another retrofit application that you think could work with photogrammetry. Send us a message (sales@photomodeler.com) and we will be happy to discuss your specific application. For additional information, the PhotoModeler Manufacturing Application page contains a summary of the above article. Also see a recent article that covers Coded Targets in a more generic way.